Large-in-Scale Trades and Block Trades: high volume trades in any outright or strategy product. Note: When a Block order is submitted on the jFCE product via X_TRADER®, it will be sent as a Trade at Market (TAM) order. Asset Allocation Trades: allows the trader to enter one side (buy or sell) of a wholesale order. Alternatively, one trader can enter the entire Asset Allocation. Guaranteed Cross Trades: an order where the two sides are guaranteed to match with one another and not exist as a different order in the market. Guaranteed Cross orders validate automatically. Large-in-Scale Package Trades: Specifically for the Amsterdam market, Professional Trades are pre-negotiated trades between two parties that take place outside the central order book. Each trader enters one side of the Prof Trade and the details must correctly match to complete the transaction. Exchange For Swap (EFS): allows trades to offset a specific OTC swap transaction for a similar commodity or a direct product of that commodity. Exchange Options for Options (EOO): allows a trade of an Exchange option position for a corresponding OTC option position. This replicates the EFS functionality available for futures contracts. Cross Orders: prearranged trades with either a party within the trading firm itself or with a specified party outside the firm. Request for Cross: A cross order submitted for a specific duration of time to allow price improvement and matching based on responses to the request from other traders. The fields in the Wholesale Order window vary depending on the exchange, type of product, or strategy you trade. If the product is a strategy, the associated legs for that strategy are listed in the appropriate fields in Wholesale Order window. If you need to cancel a wholesale order, contact the exchange and provide them with your ITM. If you don’t know which ITM was used to place the order, contact your TT Gateway administrator for your ITM (SenderCompId in the gateway hostinfo.cfg file). Select an order type in the Order Types pane and set the quantity and price for the Wholesale trade. The list below shows the common fields for submitting wholesale trades on NYSE Liffe. For Large-in-Scale Trade, Guaranteed Cross, and Cross trades, these are the only applicable fields. For additional wholesale trade types, you must also complete the additional fields listed in the sections that follow. Customer: A drop-down list of available Customers. Only customers selected in the X_TRADER Customer Defaults window appear in the Customer field list. This is an optional field. When a customer selection is made, the Account Number field is populated with the customer’s account number. Note: Any changes to customer defaults (e.g., select another customer) requires a relaunch of the Wholesale Order window to pick up the most recent changes. Account Number: Free-form text up to 14 characters. Sets an additional, user-defined client identifier. This field is optional for London products and mandatory when trading Amsterdam products. For all other markets, this field is only mandatory if you populate the Clearing Instruction field. This field is forwarded to the exchange API as ClientInfo. Account Type: Valid values are Giveup, House, Market Maker, Non Segregated, Segregated, and Customer. Sets the type of account the trade will be submitted. For NYSE Liffe, each market utilizes different values for this field. The Account Type is always optional for London products and required for all other markets. For all markets, if set to Giveup, the user must specify Trader or Member in the Party Role field and set the counterparty value in the ITM field. Note: For Cross trades, the Account Type uses the values A1-U3. For a description of these values, refer to the Account Types page in the NYSE Liffe help. Party Role: Valid values are Member, and Trader. Sets whether the value in the ITM (Individual Trader Mnemonic) field is set for the Trader ITM or Member ITM. This field is mandatory for Giveup orders. Note: This field is available for Guaranteed Cross but not available for Cross trades. ITM: Example value is 4HA. Sets the Individual Trader Mnemonic (ITM) provided by the exchange. This field is mandatory for Giveup orders. When providing an ITM, you must set whether this value equals the Trader or Member ITM by selecting the appropriate value in the Party Role field. Open/Close: Sets whether the trade opens or closes the traders’ positions. Order Reference: An optional, free-form text field that supports up to 16 characters. 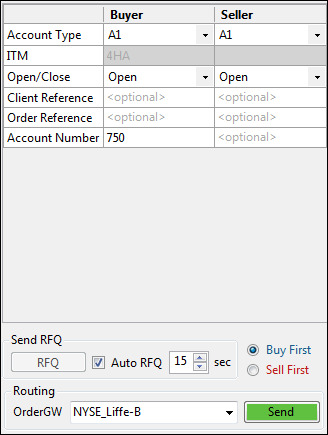 This field is optional and may equal any unique value to represent either the trader or order reference. This value, if present, is forwarded to the exchange API in the SecondaryClOrdID field. Client Reference: A free-form text field that supports up to 14 characters. Sets an additional, user-defined client identifier. This field is only mandatory when trading Amsterdam products and Account Type equals Client. This field is optional for all other cases and forwarded to the exchange API in the Account field. Clearing Instruction: Valid values are Manual Posting, Automatic Posting, and Giveup. Sets whether the trade must be posted to a specific account in the clearing system. This field in not present for London products and optional for all other markets. The selected value is forwarded to the exchange API in the ClearingInstruction field. When set to Automatic, you must provide a value in the Client Reference field. When set to Giveup, you must populate the Party Role and ITM fields. To submit Exchange For Swap (EFS) or Exchange Options for Options (EOO) trades, you must first complete the fields listed in Common Wholesale Trade Fields for NYSE Liffe. In addition, you must complete the following field listed below. ISIN: Populate this field with the ISIN code (International Securities Identification Number) of the underlying contract. The following figure shows the additional field for EFS trades. To submit Basis and/or Against Actual trades, you must first complete the fields listed in Common Wholesale Trade Fields for NYSE Liffe. In addition, you must complete the Order Details section as listed below. ISIN: You may populate this field with the ISIN code (International Securities Identification Number) of the underlying cash leg for the trade. 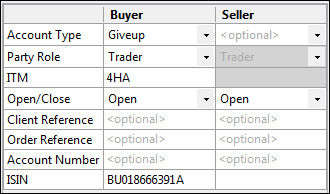 This field is required for Basis trades and optional for Against Actual. Cash Price: You may populate this with the cash price of the underlying contract. Cash Reference: You must populate this with the user-defined reference for the cash leg of the Basis. This field allows a maximum of 14 alpha-numeric characters. The following figure shows additional fields for Basis and Against Actual trades. To submit Asset Allocation trades, you must first complete the fields listed in Common Wholesale Trade Fields for NYSE Liffe. In addition, you must complete the Order Details section as listed below. Trade Identifier: Sets the user-defined numeric identifier used to group the two component legs for the Asset Allocation trade. This value is forwarded to the exchange API as ClOrdLinkID. Matching Contract: Sets the commodity key for the other component leg of the Assets Allocation trade. Forwarded to the exchange API in the OtherLegSecurityID field. Counterparty: Sets the three-character, exchange-provided ITM of the trader who submits the matching half of the trade. Forward to the exchange API in the OtherParty field. Password: Sets the user-defined three-character password for the trade. Forwarded to the exchange API as in the MatchingCode field. Buy/Sell: Sets one side (buy or sell) of an Asset Allocation order or both sides based on what option is selected. Forwarded to the exchange API in the NoSides field. The following figure shows additional fields for Asset Allocation trades. To submit Large-in-Scale Package trades, you must first complete the fields listed in Common Wholesale Trade Fields for NYSE Liffe. In addition, you must complete the Order Details section as listed below. Initiator/Reactor: Sets your role in setting up the Large-in-Scale Package trade. Select Initiator if you are the party who initiates a transaction and select Reactor if you are serving as the counterparty. Note: For Large-in-Scale Package trades, one party enters both sides of the trade. Password: Sets the user-defined three-character password for the trade. Forwarded to the exchange API in the MatchingCode field. Buy/Sell: Sets one side (buy or sell) of a Large-in-Scale Package order based on whether your role is Initiator or Reactor. Forwarded to the exchange API in the NoSides field. The following figure shows additional fields for Large-in-Scale Package trades. 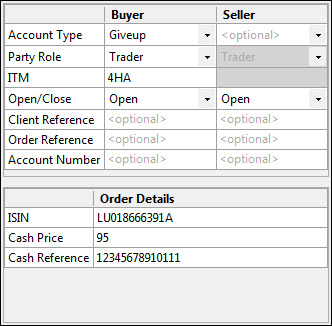 Select Cross or Guaranteed Cross in the Order Types pane and set the quantity and price for the trade. Complete the remaining fields for both sides of the trade as listed in . The default setting is Auto RFQ with a timer. To manually send an RFQ, uncheck this setting and click the RFQ button. This is the same RFQ functionality that can be used via the Market Grid. For Euronext commodity option contracts, you can submit a Request For Cross (RFC) order using the Wholesale Order window in X_TRADER 7.17.65 and higher. An RFC provides an alternative to submitting an RFQ for both the member who initiates the RFC and the crossing member. Both the Buy and Sell side of the RFC must be entered in the Wholesale Order window. Per exchange rules, only one RFC can be active in a given contract or strategy. 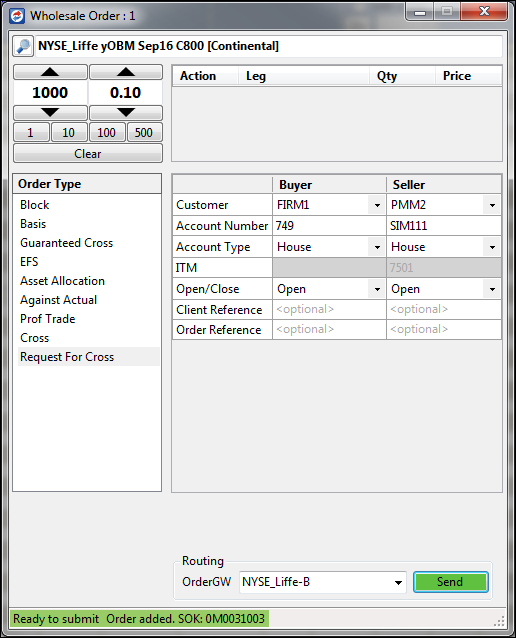 Select Request for Cross in the Order Types pane and set the quantity and price for the trade. Complete the remaining fields for both sides of the trade. Once the fields are complete, click the Send button. Confirm the order and click Yes.